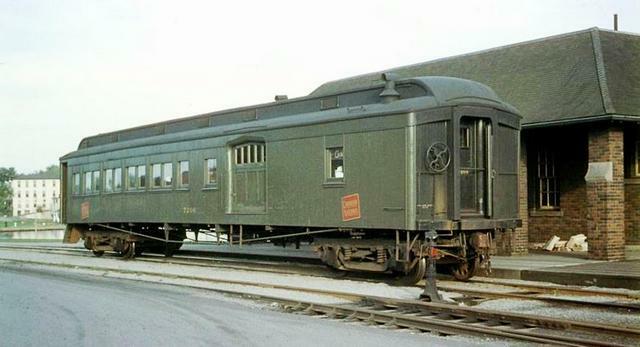 Thousand Islands Ry 500 with wooden combine 200, a typical passenger train, 1948. Tiny 500 sits at Gananoque Jct. station with CNR 6233 on the mainline in this 1945 scene. The only other diesel locomotive small enough to work the TIR was CNR 77 shown above. 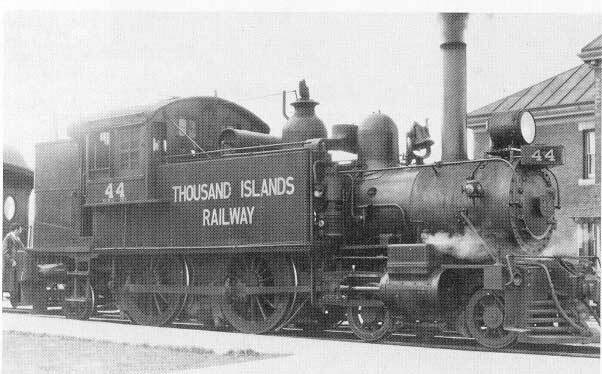 The tiny Thousand Islands Railway was one of the smallest railways in Canada; originally three miles long, it connected Gananoque, Ontario, on the St. Lawrence River with the Grand Trunk Railway of Canada's Montreal-Toronto main line. 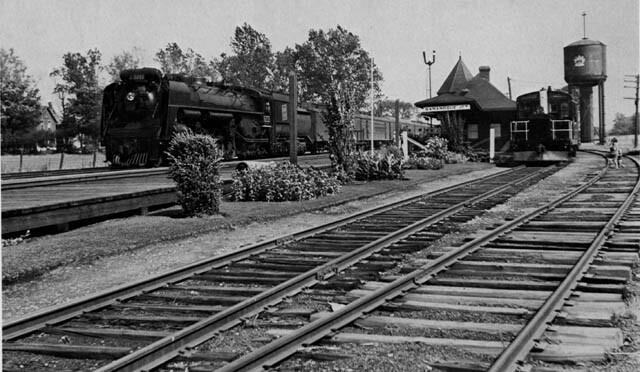 An early attempt by local business interests to get a connection to the "Trunk Line" was the incorporation on February 15, 1871 of the Gananoque & Rideau Railway. It failed to get off the ground, which was not un-common with early railway construction efforts which were unable to raise the necessary funds. 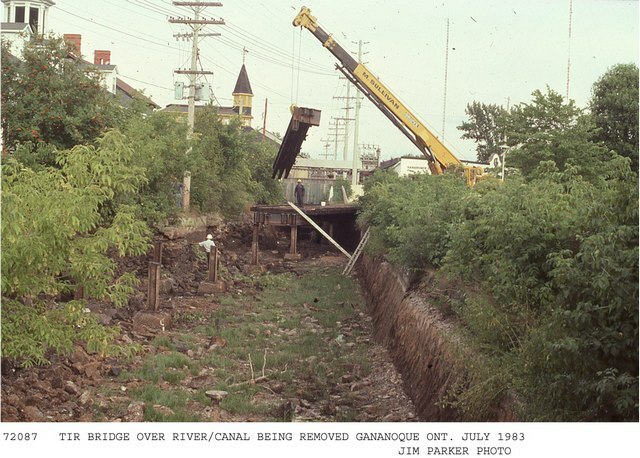 In 1883 the charter was revived by the Rathbun Company Ltd. interests, the work was soon completed using 56 pound rail with a maximum grade of .84 % crossing over the Gananoque River three times, with the line opened January 1, 1884. The name was changed on March 25th. to Thousand Islands Railway. Success this time was ensured by the GTR which supplied the rails and took a mortgage in return! And by the Village of Gananoque, (which by that time had a population of 4,000), which aided the effort by granting a cash bonus (a common practice), subscribing to stock itself (a less common practice), and by granting a perpetual exemption from taxes, a very un-common practice! Rathbun owned a dockyard and wharf in Gananoque, where its ships landed and wanted the railway to get its timber and sawn lumber from the Ottawa, Smiths Falls and Rideau area to market. The Rathbun Company of Deseronto was one of Ontario's largest lumber operators in Ontario. 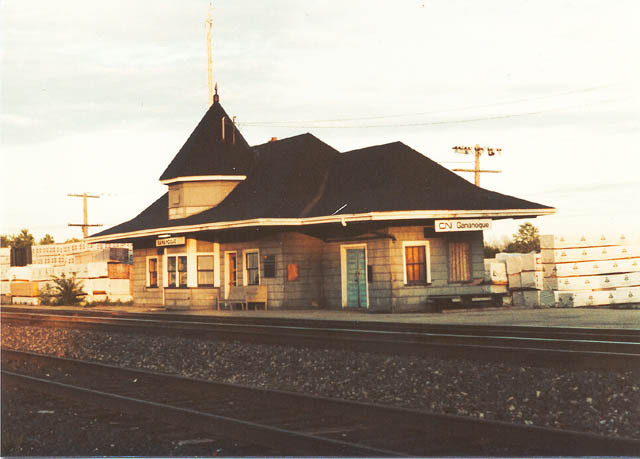 They also owned a cement plant, brick yards, saw mill, iron smelter and a railway car building plant, along with other railways including Bay of Quinte Railway and Oshawa Railway. 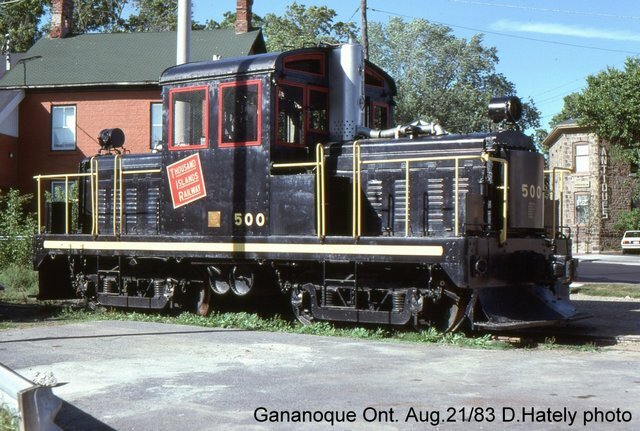 Gananoque, Perth and James Bay Railway was incorporated April 1884 to build from Gananoque to the GTR thence to Merrickville with branch line to Westport. 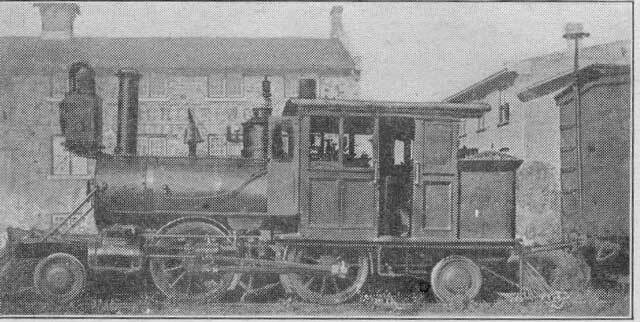 It was merged into the TIR May 1888 at which time the railway was declared "to be for the general advantage of Canada." This designation brought it under Federal rules and regulations. At the same time, an extension to James Bay no less was authorized along with a branch to Ottawa. 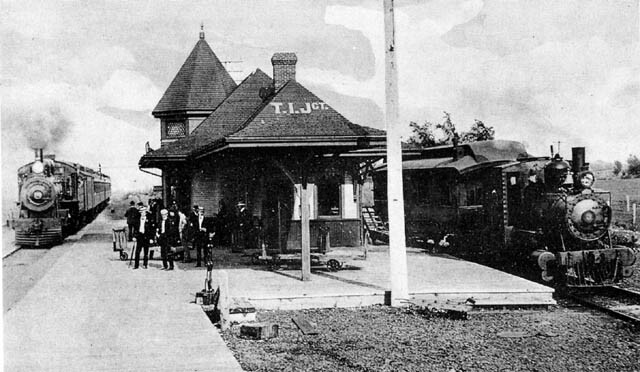 Nothing came of these expansion plans and the Thousand Islands forever remained one of Canada's smallest railways. A quarter mile long spur was laid in 1894 across the Gananoque River on a 120 foot swing bridge to serve docks and warehouses located on the east side. This continued in use until 1981 when the last customer ended rail use. It was dismantled in 1985. A short extension was opened in early 1902 at the connecting point with the GTR whereby a third track was laid along the GTR right of way two miles westward to a new station location at a more favourable location. The original Thousand Islands Junction having been located on a steep grade. Rathbun's timber reserves were becoming exhausted by 1911 and the family began selling off its industrial empire. The B of Q was sold in 1910 MacKenzie and Mann who were then building the Canadian Northern Ontario; while the Oshawa Railway was sold to the GTR. The GTR had operated both the Oshawa and Thousand Islands since March 1,1910, and acquired all stock March 6, 1911. Rathbun Co. continued in business gradually dwindling until finally in 1923 it was liquidated, thus ending the Rathbun era. TIR 44 4-4-2T acq. 12/1927 ex CNR 44 ex GTR 1533 ex TBL. GTR #1251 3/1892. 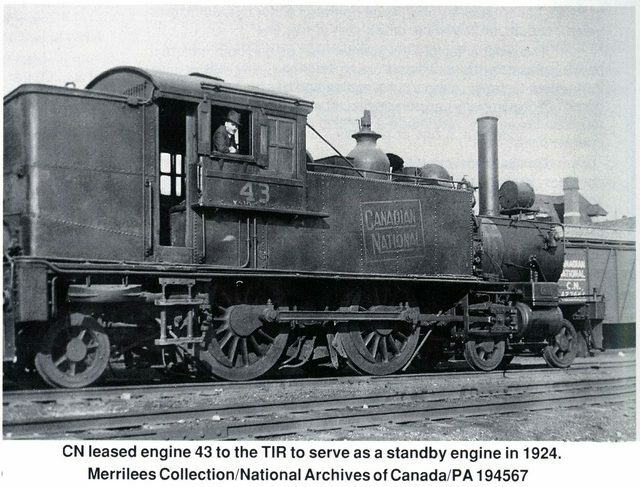 One of five tank engines built in the GTR Point St. Charles Shops for the Toronto Belt Line Ry. Later used in Montreal Suburban service. of the World's Columbian Exposition 1893 Chicago. It too went in 1912 to the Thurlow Ry. 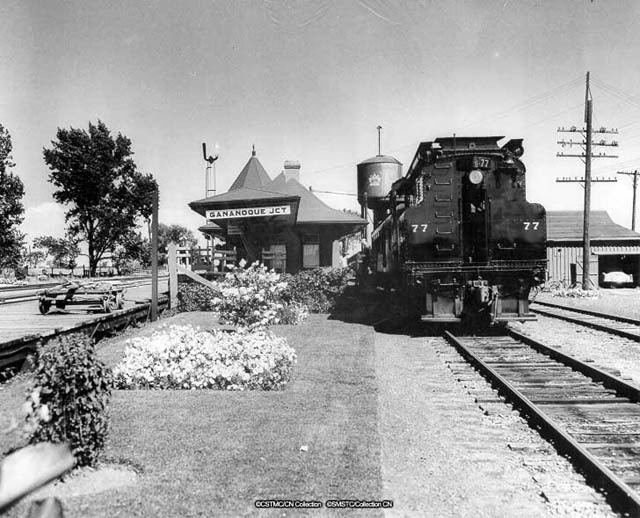 This station was built by the GTR in 1901 and was later re-named Gananoque Junction, thus the railway ran from Gananoque to Gananoque Junction! It had two official stops enroute, one not far out of the Junction at Cheesborough, a small settlement of a few houses where a cheese factory operated until 1938. The other stop was at an umbrella shelter on King Street in Gananoque. Canadian National Railways took over the bankrupt GTR and continued operating it as a separate railway due to its unique tax exempt status. 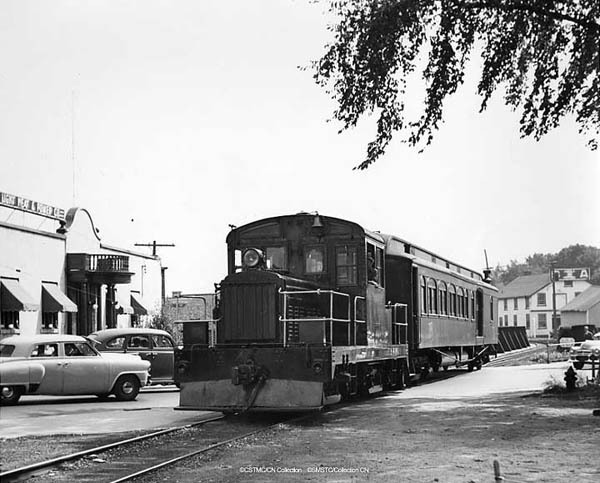 When this exemption was ended in 1958 by Gananoque there was no longer a need to keep it as a separate company and the Thousand Islands Railway was amalgamated into the CNR December 12, 1958. Further changes took place with the end of passenger service by 1962 and the decline of freight service with the last customer ending use of rail in 1995. The entire railway was abandoned and dismantled in October 1997. Little remains of this once-unique little railway that for many decades served the public. 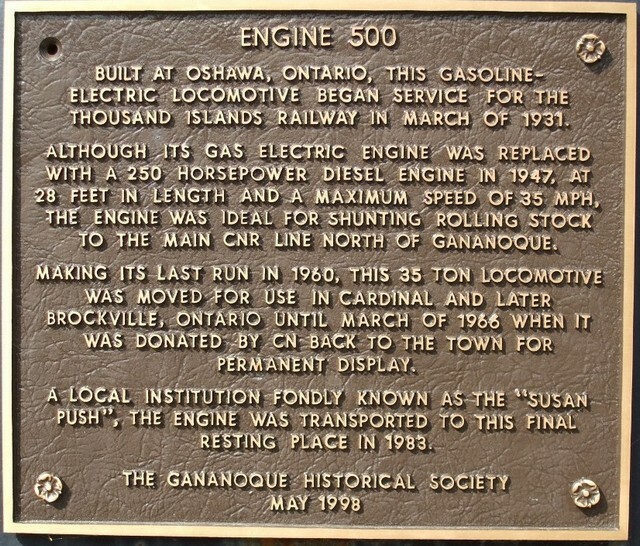 The tiny one-of-a-kind locomotive has been preserved and put on display in Gananoque as a reminder. TIR 500 on display in Gananoque. CN 7206 (ex CNoR 7206, nee CNQ 1511) wooden 36 seat 62 foot combine.